Flagstaff is a beautiful mid-sized city, nestled at the foot of the San Francisco Peaks at an elevation of 7,000 feet. It is noteworthy for being the gateway city for the Grand Canyon; because of its proximity to several noteworthy tourist attractions (Sunset Crater, Meteor Crater, Walnut Canyon, among others), it has been dubbed The City of Seven Wonders. It is also known for being a primary stop along the Santa Fe Railroad and Route 66. Flagstaff is situated within the largest contiguous ponderosa pine forest in the United States, which is why logging has always been one of its most important industries and why Northern Arizona University is known for its forestry department. Lowell Observatory was built here in 1899, and it is where the planet Pluto was discovered in 1930. 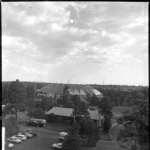 This page will show images of Flagstaff, past and present.